Also known as a sea fan or a sea whip, a gorgonian is a type of sessile colonial cnidarian which is found particularly in the tropical and sub-tropical oceans throughout the world. They are similar to the sea pen, which is a type of soft coral. There are 500 different species of gorgonians found around the world. Most of these can be found in the Atlantic Ocean, near the West Indies, Bermuda, and Florida. They mostly live in shallow waters, however some species have been found several thousand feet below ground. Its shape and appearance correlates with their location. More flexible, fan-shaped gorgonians are found in shallow areas with strong currents, while stiffer, thinner, and taller gorgonians are found in calmer, deeper waters. Gorgonians are actually made up of tiny individual polyps which form colonies. These colonies form into a flat, erect, and branching plant which looks almost like a fan. However, some can be encrusting, bushy, or whip-like. A colony of gorgonians can be several feet tall or several feet wide, but only a few inches thick. They come in many bright colours, including yellow, red, and purple. Gorgonian that are photosynthetic can be kept in captive reef aquariums. The structure of gorgonian colonies vary. Suborder holaxonia skeletons can be formed with a horny, flexible crust called gorgonin. However, suborder scleraxonia skeletons are formed with grouped calcareous spicules. 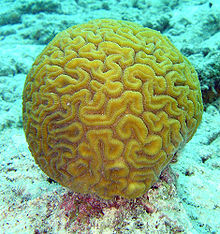 There are also some that encrust like coral. 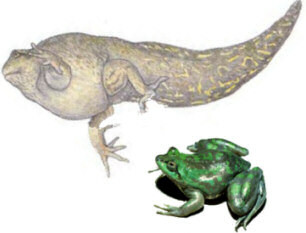 However, both holaxonia and scleraxonia skeletons actually anchor themselves in sand or mud, instead of attaching themselves to a hard substrate. Each gorgonian polyp has 8 tentacles. These tentacles are used to catch plankton and other matter which they consume. They eat them by using a filter feeding process, where the fan orients itself across prevailing currents to maximise water and food supply. 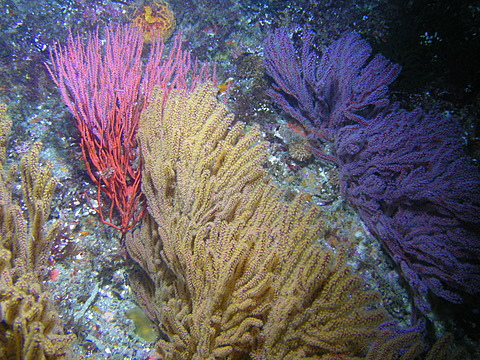 Some gorgonians have symbiotic relationships with algae or zooxanthellae. This relationship gives the gorgonian nutrition due to photosynthesis. 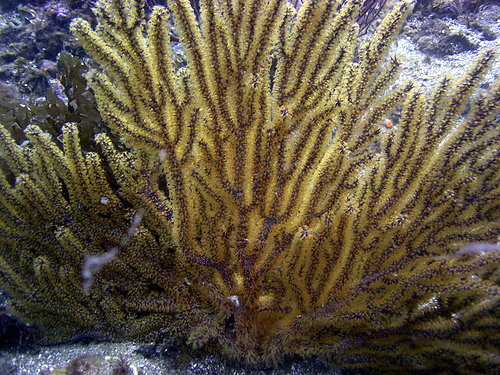 You can tell the difference between gorgonians that possess zooxanthellae, as they have brown polyps. Those without zooxanthellae are more brightly coloured. Other fauna like brittle stars, bryozoa, and hydrozoa live within the gorgonian colonies branches. In addition, the pygmy seahorse uses some gorgonian species as its home because it keeps them well camouflaged as it closely resembles its host gorgonian.